Redoubling Quandary: When Is Your Position Too Good? Your step-by-step guide to becoming a masterful backgammon player. Backgammon is an exciting, tactical game, and this straightforward book enables newcomers to get in on the fun, as well as providing expert advice for the more experienced player. Fully illustrated, it's packed with opening strategies, middle- and end-game tactics, tips on how to make key moves, and advice to get you up to speed on dice probabilities. You'll be hooked in no time! AUTHOR: Chris Bray has been playing backgammon for over thirty years. He is a multiple tournament winner and plays regularly on the European circuit. Chris writes the only backgammon column published in a national newspaper, The Independent, where his words have graced many a breakfast table on a Saturday morning for the last fifteen years. 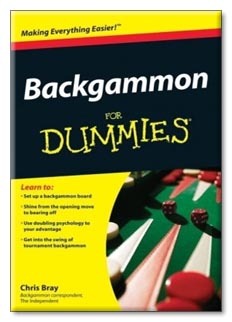 Chris is also a prolific author and Backgammon For Dummies is his fifth book. His other works include What Colour is the Wind? and Second Wind. Chris lives in south-west London with his wife Gill and daughter Kate.